In early October, Linkin Park did a mentoring session with Zayed Hassan, the grand prize winner of the Stagelight Monthly Music Contest, at Red Bull Studios in Los Angeles. During the sessions, Rob Bourdon recorded drums for the song "Sailing Through The Clouds". "I started working on "Sailing through the clouds" back in 1999-2000. I only knew how to play guitar back then. Since I had no professional setup back then, so I used to input the midi notes from my guitar to my music arranging software manually- one by one. However over the time the tune evolved, harmony of the song took better shapes and elements of the song kept changing. Later when I started to collaborate with artists around the world, I asked many of my musician friends to contribute for this song. My sole purpose was to make a track, that speaks about different cultures and ethnicity, through the language of music! The tracks "Sailing through the clouds" and "A Text From The Parallel World" are two ethnic fusion experimentals. I tried to stitch the musical cultures which fascinate me most!" 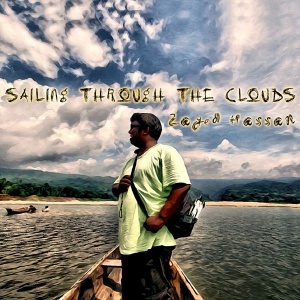 "Sailing Through The Clouds" was released on August 18, 2016 to digital stores. Besides drums from Rob, the track also features vocals by Nigerian singer Victor Agbo and a musical contribution by Bill Burley. Features Bill Burley, drums by Rob Bourdon, and vocals by Victor Agbo. The single was released on August 18, 2016, but the track was uploaded a few days earlier to Zayed Hassan's SoundCloud page. This page was last edited on 20 February 2018, at 22:06.